Their importance lies in the details which separates great from good design, according to the architect and designer Mies van der Rohe. N.U.D. Collection was created out of this spirit where the boring becomes beautiful. Change a room with an unexpected combination. Match, create contrasts, but more importantly experiment. When do you want to start? 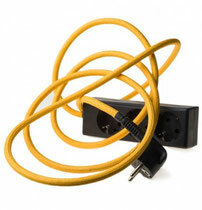 Extension cord with 3-way socket and 2,5 meter textile cable. 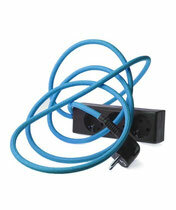 Cable type H05VV-F 3g1,5. 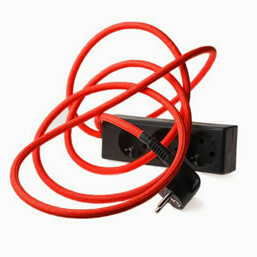 Schuko plug, Danish plug. 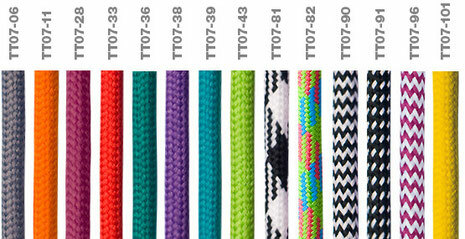 Please see below for colour options for the textile cable. Extension cord with one socket and 3 meter textile cable. Cable type H03VV-F 2×075. 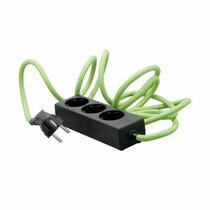 Euro plug class 2, Danish plug. See to the left for colours options for the textile cable. "The extension cord is very beautiful ; I used to hide my cords under the furniture or under the bed or nail them to the wall. This is a decorative object in its own right"
"So simple, so good. Zappy and fresh !" "I bought one for my friend- not your usual kind of present- a bit naff - but it is so beautiful that it is a pleasure to give and guaranteed to be appreciated"